Me too. She carries that dress off well. And I don't think that would be easy to do with that style of dress. What lovely photos. And they so so relaxed and natural too. Best photos I’ve ever seen of them. Well done! Great news. This will be a nice real royal wedding. Congratulations to Eugenie & Jack! There were whispers for a while now. She's the one due to move into KP, not Bea, right? I guess this was on the cards for a while. Great news! 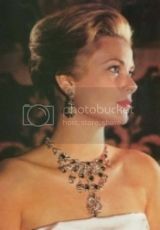 I have always dreamed that she would wear the Strathmore Rose Tiara for her wedding, she looks so like the Queen Mother. Congratulations to Princess Eugenie and Jack, may they be very happy together! The timing couldn't be better as it should put the other couple, Harry and MM7, in the background as this union and wedding preparations will be a welcome news. I like the nice understated engagement pictures taken within the palace. This is nice news for a change! The engagement photos hit just the right note of dignified yet youthful joy. She looks lovely. I bet Andy is happy that Eugenie has plumped for St George's rather than anything low key, though this wedding won't be televised. Whether Philip will be so overwhelmed with joy at seeing the mother of the bride at the wedding and reception is another matter! I think Eugenie will wear Sarah's tiara and Beatrice is a shoe-in as bridesmaid, I think. I do feel a bit sorry for Beatrice. Her sister so happy and no boyfriend lined up at the moment. They look happy. Jack's smile reaches his eyes. Any guesses about Randy pressing HM for a title for Jack? I think Andy might secretly like it if Jack got an earldom or something as he's so hung up on titles and maintaining the importance of the Yorks. If we were taliking about a wedding in 1959 I would say absolutely. However Tony Armstrong Jones in the early 1960s was the last married-in to accept a title. Mark Phillips refused one when he married Anne and I'd say that the Queen recognises that the time of males accepting Dukedoms and Earldoms because they married into the BRF is well and truly gone. Public opinion isn't for it nowadays.